Washington has begun delivering military hardware to Ukraine as part of NATO’s ongoing anti-Russian military build-up in eastern Europe, escalating the risk of all-out war between the NATO alliance and Russia, a nuclear-armed power. The Obama administration announced on Wednesday that it would transfer 30 armored Humvees and 200 unarmored Humvees, as well as $75 million in equipment, including reconnaissance drones, radios and military ambulances. The US Congress has also prepared legislation to arm the Kiev regime with $3 billion in lethal weaponry. Washington is at the same time deploying 3,000 heavily armed troops to the Baltic republics, near the Russian metropolis of St. Petersburg. Their 750 Abrams main battle tanks, Bradley armored personnel carriers, and other vehicles are slated to remain behind after the US troops leave. This handover is aimed at “showing our determination to stand together” against Russian President Vladimir Putin, US Major General John O’Connor said in the Latvian capital, Riga. Washington is pressing ahead despite stark warnings from Moscow that it views massive weapons deliveries by NATO to hostile states on its borders as an intolerable threat to Russian national security. The decision is also sharpening tensions between Washington and Berlin, which backs the current policy of sanctions and financial strangulation of Russia, but opposes moves that threaten all-out war with Russia. Visiting Washington yesterday, German Foreign Minister Frank-Walter Steinmeier urged a continuation of the strategy of “economic and political pressure” on Russia. Arming Ukraine, could “catapult (the conflict) into a new phase,” he warned at the Center for Strategic and International Studies (CSIS) think tank. The mood in broad sections of the American ruling elite has turned increasingly hysterical, however, after the Kiev regime’s defeat prior to last month’s ceasefire in Ukraine negotiated by German, French, Russian, and Ukrainian officials in Minsk. This week, Pentagon and Congressional officials called for Washington to arm Kiev, pressing for faster action from the White House. Defense Secretary Ashton Carter and Chairman of the Joint Chiefs of Staff Gen. Martin Dempsey are pressing for large-scale weapons deliveries to Kiev, as are leading members of Congress from both big-business parties. “The fact that it appears that the president may have made a commitment to [German Chancellor Angela] Merkel while she was here, or the German ambassador, not to do that certainly has created a lot of concern on both sides of the aisle,” said Republican Senator Bob Corker. “I don’t buy this argument that, you know, us supplying the Ukrainian army with defensive weapons is going to provoke Putin,” said Democratic Senator Chris Murphy. With a toxic combination of maniacal aggression and thoughtlessness, the NATO alliance is lurching towards a war with Russia that could destroy the entire planet. Warnings about US policy from Berlin, which itself has led the European imperialist powers in supporting the February 2014 putsch in Kiev and backing the Kiev regime’s bloody war in east Ukraine, have at most a tactical character. The only force that opposes war is the working class, in America and Europe and internationally. Despite Berlin’s misgivings as to US policy, the NATO alliance is pursuing its escalation against Russia. At a press conference Wednesday, NATO Secretary General Jens Stoltenberg and NATO Supreme Commander of European forces General Philip Breedlove laid out the ongoing military build-up across eastern Europe. They spoke at the Supreme command Headquarters of Allied Personnel in Europe (SHAPE) in Mons, Belgium, which oversees NATO operations in Europe. Referring to NATO member states’ pledge to massively increase defense spending at the recent Wales summit, Stoltenberg pledged to “keep up the momentum.” Besides the escalation in the Baltics, naval exercises are taking place in the Black Sea, and NATO is preparing for the largest exercises for many years, with 25,000 men, in southeastern Europe. Breedlove said he had never seen greater “unity, readiness and determination within NATO to tackle the challenges of the future together.” He was sure that this would continue. The German Chancellor’s office criticized Breedlove for “dangerous propaganda” and making “imprecise, contradictory and even untruthful” statements. German imperialism backed the coup in Ukraine, using the crisis to create political conditions for it to rearm within the framework of NATO and pursue its economic and geostrategic interests in eastern Europe militarily. 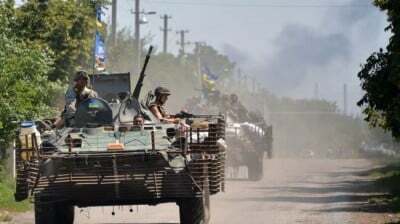 It fears an escalation of the conflict in Ukraine, however, as it could expand into all-out war between NATO and Russia, for which the German army is not yet ready.